If the holiday season doesn't already have you feeling glittery all over, get ready. 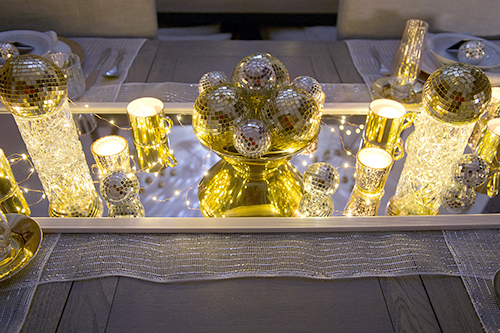 I put together a glamorous, glowing New Year's Eve dinner party so you're about to see a lot of sparkle! For this tablescape, I partnered with Lowe's to show you how to use your DIY skills to create a really special dinner party scene without breaking the bank. 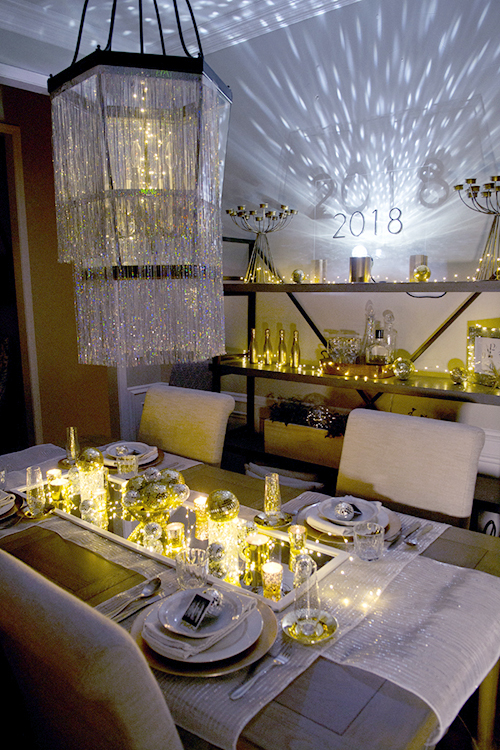 It was a blast to put this together, and I'm already thinking about how to have a dinner party every month just so I can break out the sparkly stuff more often! 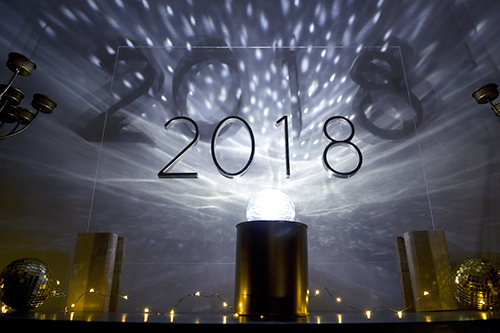 Let's start with my favorite DIY part of the party decor, the 2018 projector light. I had a Pavlovian reaction every time I plugged it in - instant dance party. It's still pretty even during the daytime, and the twins were basically hypnotized every time I turned it on. To fully appreciate how bringing this projector light inside (it's the same kind you use to project snowflakes on the outside of your house as part of your holiday lights) changes the entire vibe of my normally bright, casual dining room, you have to see it in Boomerang form. The light swirls around the ceiling, and it feels so much like a disco ball. It gives a fun nightclub vibe, perfect for NYE. How did I make the projector look a little more like a lamp with a base? I stuffed it inside a quart-sized paint can that I spray painted with Valspar's gold metallic enamel paint. Did you know they sell empty paint cans at Lowe's? Me either, but it was perfect as a little base for my projector. Wondering where I hid the cord to the projector? It's taped to the back of the can so you can't see it and runs back behind my shelves to the closest plug. Once you add the letters or numbers on the sheet of acrylic behind it, it becomes infinitely customizable. I'm thinking you could use this for graduation parties, birthdays, weddings, etc. For this party, I used my hot glue gun to adhere the nickle street numbers to the sheet of acrylic. To make it stand straight up (which is necessary so that you can project the shadow on the wall), we used some spare pieces of wood we had in the garage to create a base. Basically, two chunks of wood were screwed together (with the acrylic sheet in between) in each corner. Voila, an acrylic sign that is unique to your occasion! I had so much fun playing with the shadows to see the best way to project it on to the wall. I'm no lighting engineer but I think the background shadow adds a little extra oomph. And because I wanted the strobe light fun from the ceiling to continue down to the tablescape, I decided to use a $6 wall mirror for my table runner. 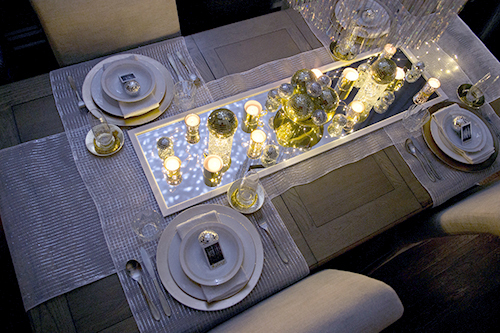 It's hard to beat $6 for a table runner, and this one has the added bonus of reflecting all of the swirling lights from the ceiling so that even when you're sitting at the table and looking at your friends, you can still see the dancing lights in the center of the table. There I am, obsessing over my Boomerangs. I'm telling you, nothing shows off the DIY projector-light-disco-ball-thingamabob better than a Boomerang. Have you ever used decorative mesh ribbon as a garland for your Christmas tree or stair banister? 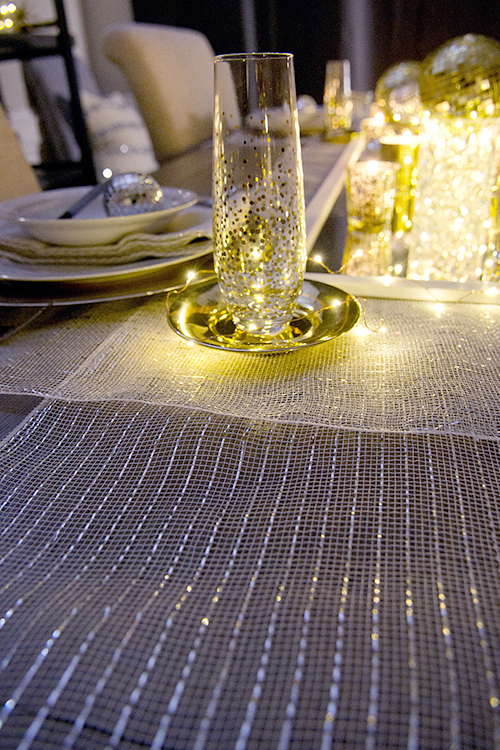 I bought a 30 foot roll of the white/silver colorway to create this subtle, sparkly table runner and I'm so impressed with how well it works for this purpose. The silver threads catch the light beautifully. Sometimes they looked gold, sometimes they looked silver, but they always looked subtly glamorous. I was able to create a table runner and four place mats with my $10 roll, and I had a lot left over. The beauty of the white/silver combo is that it could be adapted to so many different parties, just like the acrylic sign. We all know that white goes with almost everything! I think it's so versatile that I'm going back to buy more when the holiday stuff goes on sale. 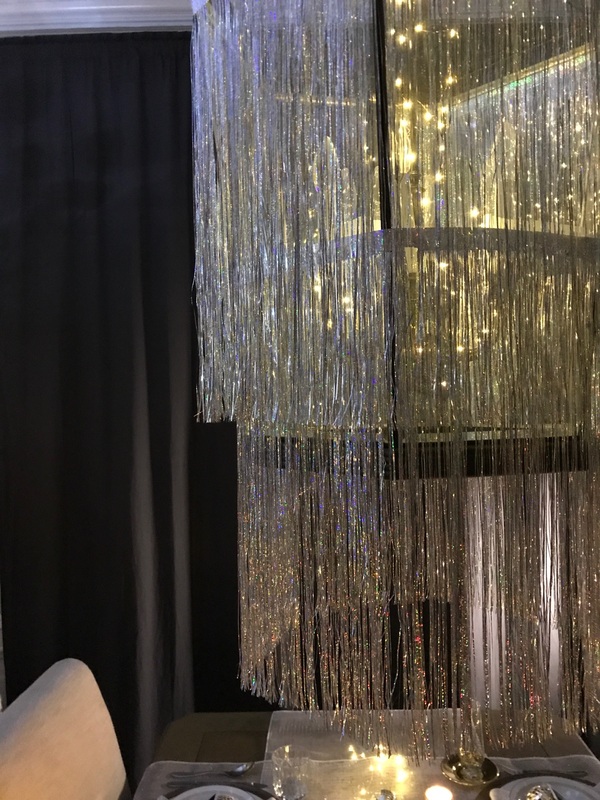 Did you notice my lantern chandelier hiding under a glamorous sheet of tinsel? How fun is that sparkly silver? It fits the theme so much better than my plain lantern, and it was so easy to do. When you buy the silver tinsel (which some people call "icicles"), it comes in sheets that are folded into fourths. If you want to use the icicles individually to drape them on your tree, you simply tear or cut them off the top strip. I kept them on the strip instead and taped them to my chandelier, using two layers to create dimension while covering the whole chandelier. This is one of my favorite parts of the NYE makeover, and it was also one of the easiest. I have a new appreciation for tinsel. The way the light from the projector bounces off the tinsel really helps it shine. 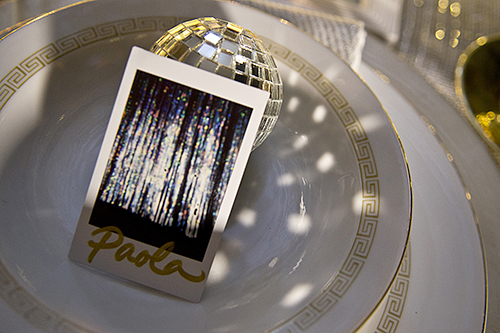 I actually used my instant camera to take closeups of the tinsel for the place cards. It ended up being a glittery abstract photo that I felt like really captured the happy, playful feeling of NYE. 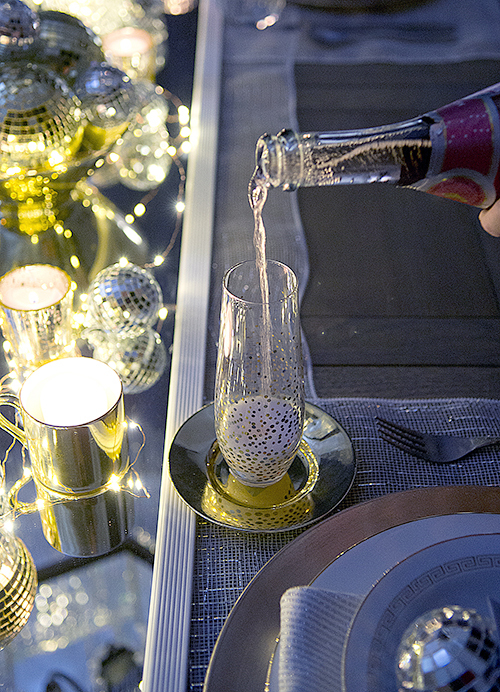 For nights like this, there is no such thing as too much sparkle. 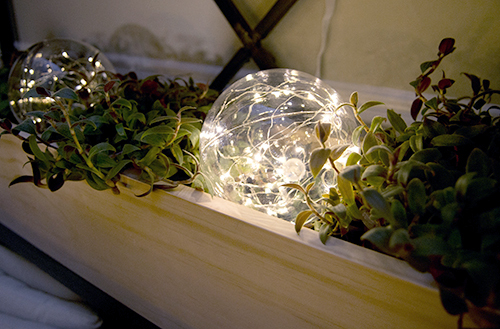 One of the most versatile products I brought home from Lowe's for this project was the LED string lights. I liked them so much that I put them everywhere - along the table runner, inside the bowls and glasses in the centerpiece, on my shelves behind the table. I even hid a strand inside my chandelier because I preferred that soft glow over the current light bulbs inside my lantern. Those tiny lights make every surface instantly feel like a party. 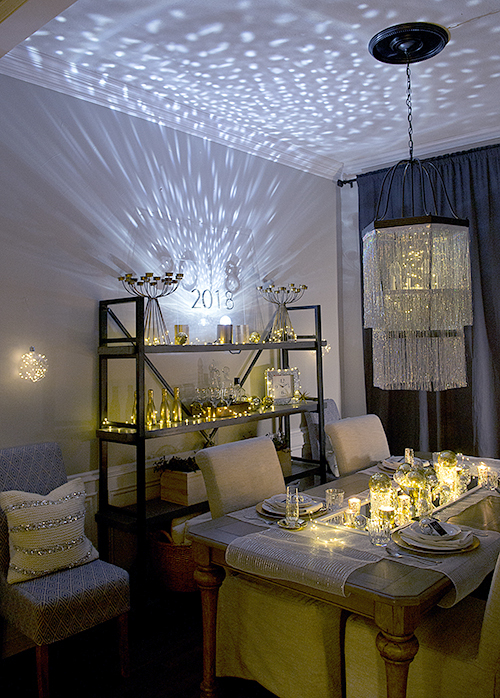 This NYE decor is really all about playing with lights and reflective surfaces. Between the projector lights, the LED copper light strings and the candlelight, everything really glows. 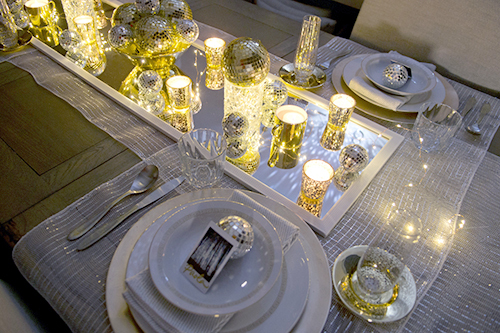 By adding the mirrored surfaces everywhere, from the table runner to the disco balls and even the metallic candle holders, the light bounces around and makes it feel ever warmer and more festive. Dare I say, glamorous? As a mother of twin toddlers, it's been a LONG time since I felt glamorous. I almost forgot to mention the LED orb lights! I found those at the last minute and Supermarket-Swept five of them into my cart instantly because I loved them so much. They come with clear string and a hook so you can hang them from trees like giant ornaments, but I chose to hang two from clear thumbtacks above the side chairs on either side of the shelf. I even added a few inside my planter box to have a tiny glow on that third shelf. 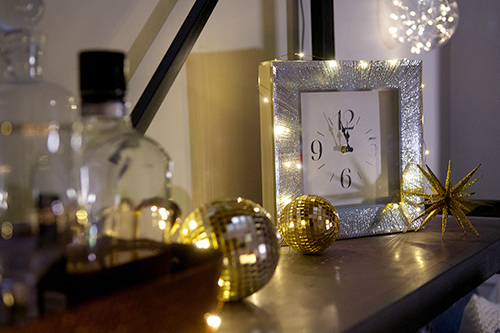 Speaking of shelves, I styled them out with this glitzy clock, which is a must for counting down to midnight. It's really this clock that set the tone for all of the decor. The silver frame almost looks like fireworks, and it just screamed NYE to me. Then I brought our little bar (a flea market hammered copper tray with some random glasses and bottles of whiskey) from the den to the shelves, along with a few mini golden bottles of champagne for extra pizazz. *jazz hands* The shelves were dark at first, but the string lights solved that problem. When I was trying to accessorize this space, I basically just walked around my house and tried to find anything metallic. If it was gold, silver or copper, I brought it to this room I am a big fan of mixing metal finishes because I think varied shades adds more interest. If everything in this room were silver, it would be icy cold. That's still a fun theme if that's the vibe you want, but I'm more of a warm golden girl myself. GOLD SPARKLES EVERYWHERE! Thank goodness I already had a thing for disco ball ornaments because my extensive collection really came in handy for adding even more New Year's Eve vibes to the decor. I mixed both silver and gold disco balls throughout the table and on the shelves, wherever I found a surface that needed a little something. It always helps to have varying heights in your centerpiece even when you're like me and you prefer to keep it low so your guests can talk across the table without their view being obstructed. 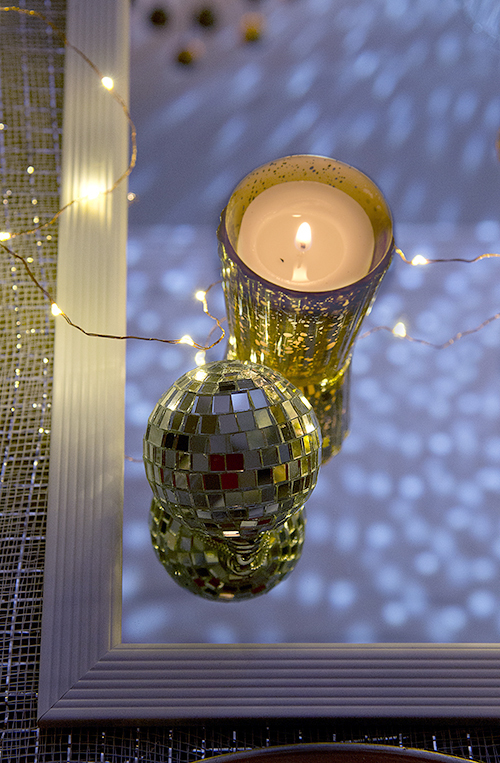 In this case I used a brass bowl and some crystal whisky glasses to elevate some of the disco balls off the mirror. The crystal glasses were perfect pedestals because I was able to stuff some of the LED string lights inside and get a glow from the inside out. The cut glass on those cups bounces light around the room almost as effectively as the disco balls. So, who wants to come to my party? As long as someone else handles the cooking, I'm in. Hop on over to my Instagram (@jordanG106) to see me walk through some of the details in person with my Instastory. Warning: My voice is cringeworthy. I can't help it. Bear with me. Guess what? I'll be back this week for part 2 of this series where I set this same scene with completely different decor for a fresh, happy New Year's Day brunch. Because why have one party when you can have two? Photos by the lovely, talented Renee Fernandes. Boomerangs by yours truly.